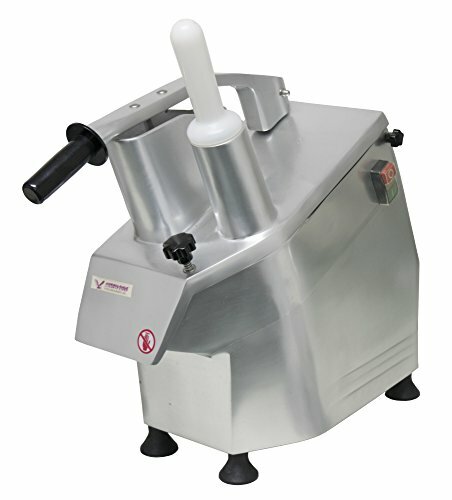 The American Eagle AE-VC30 food processor and vegetable cutter is a heavy-duty, high-quality machine designed for commercial kitchens the variety of available disks makes any kind of vegetable preparation work easy. Easily dice, chop, create strips, cut wavy vegetables and slice with optional disks. Five disks are included with the machine (5/42", 5/32", 1/8" shredding disks and 5/64", 5/32" slicing disks) expand your menu possibilities and save time and labor costs the machine sports a durable polished aluminum alloy body that is seamless and water-resistant in design so that it can operate even in the most demanding damp conditions of a commercial kitchen. A 2" diameter round hopper and a 6" x 3" large hopper are built into the top of the unit at an ergonomically friendly 45 degree angle for easy continuous feed operation and maximum output. For safety, the motor stops when the built in food pusher is lifted 12" above the opening. Processing disks are hand wash only but have stainless steel knife edges that are easy to clean and maintain. The 2" round hopper is specially designed to accommodate long shaped vegetables such as carrots and cucumbers and the large hopper is designed to accommodate larger whole vegetables, fruits and block cheeses. With a cycle speed of 270 rpms, the machine can easily handle up to 661lbs/hour of processing productivity. If you have any questions about this product by American Eagle Food Machinery, contact us by completing and submitting the form below. If you are looking for a specif part number, please include it with your message.